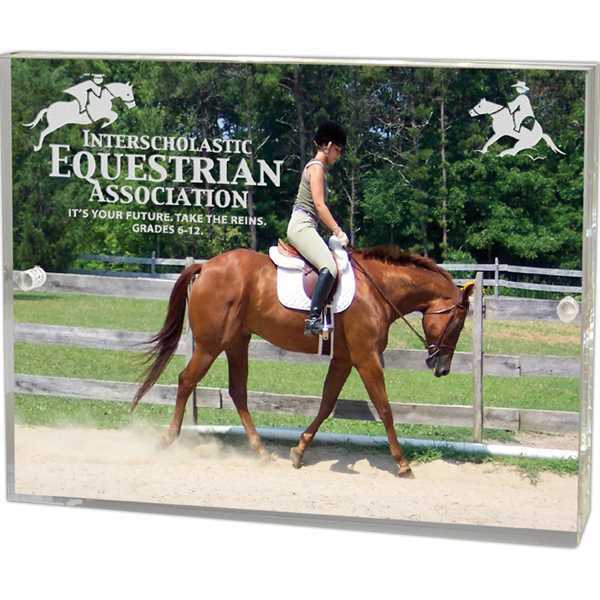 Imprint Method: Laser Engraved - Bestow the clear acrylic 4" x 6" frame on your most "magnetic" achievers! Your favorite pictures or graphics can easily be changed on this versatile frame, held by small but powerful magnets. An honoree's silkscreened or engraved name and accomplishment will last virtually forever on this unique award. Make this a perfect accolade for awesome sports, school or university achievements. Boost your brand with this handy office advertiser! Size: 4 " x 6 " x 3/4 "
Engraving On Metal Plates: Standard plate size is 2-5/8" x 5/8."